Draw Pilgrim Chore Chart – a free printable! This must be the dang prettiest chore chart I ever did see… and it’s free! Draw Pilgrim, a supremely talented artist from Melbourne, made this beautiful chart for children to track their chores. It fits up to five names or tasks, keeping parents happy and the house orderly. We featured Draw Pilgrim’s artwork in September and we regularly follow her developments on her fantastic blog. She made the chart especially for vintage fab children’s blog Modern Kiddo, for whom she does all graphic art. 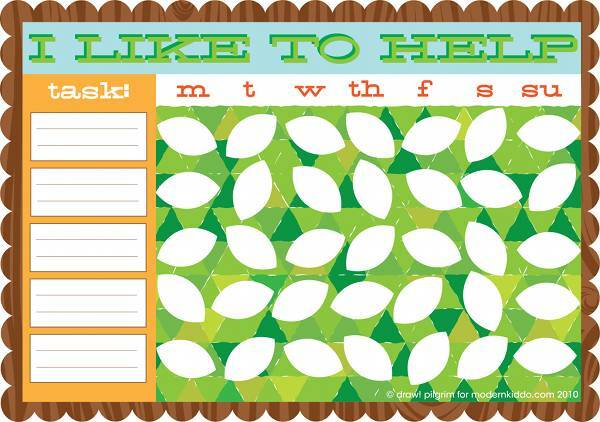 Download the free printable and get those kids helping out! Also see this other cute chart we told you about in November 2009.